Today marks the beginning of 45North Tuesday tech! For the next six Tuesdays we will be sharing detailed information about the technologies we use in various products. The series will lead with Micro-Glass rubber - the anti-slip technology used in the outsole of the award-winning Fasterkatt. Lets start with a basic explanation of what causes slip. An easy way to understand the way slip works is snow skis. Snow that has not been agitated tends to have an abrasive surface. It is also composed mostly of moisture. When a ski glides across snow it creates friction, and this friction results in a very thin layer of moisture forming between the bottom of the ski and the substructure of the snow surface. If it were not for this layer of moisture skis would not glide. This is why skis are slower in sub-zero conditions than they are when it is closer to the freezing mark. The same principle applies to footwear - a layer of moisture between the outsole rubber and the walking surface promotes slippage. Our challenge was to reduce slippage, so we focused on penetrating that small layer of moisture on a microscopic level. 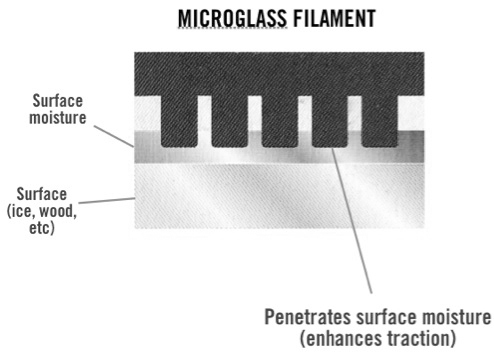 The microglass rubber is made by magnetically aligning small glass filaments so they are oriented vertically within the rubber. This vertical orientation allows the microscopic glass shards to penetrate the surface moisture. As the outsole wears, these vertically oriented filaments/shards remain exposed to ensure pro-longed grip. Because of this specialized rubber production process, it is necessary to manufacture small pads to control the distribution and accurate orientation of the glass filaments. 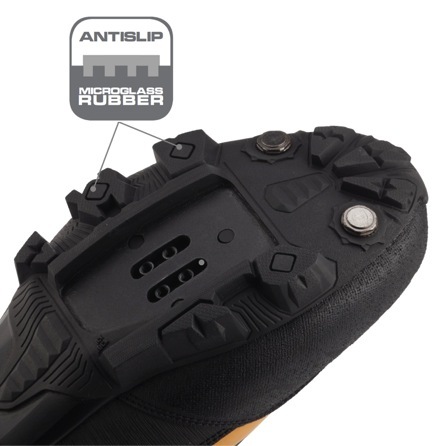 These small pads are then co-molded into the natural rubber outsole with careful placement in areas where your foot will make prominent contact with the surface (forefoot and heel). Fasterkatt users will benefit from this technology when they ride in the wet, cold and slippery conditions the shoe was designed for. Whether you are walking on linoleum, wood, concrete or ice, the Micro-Glass filament lugs will reduce the likelihood of a surprising slip or fall. Fasterkatt is also the first cycling shoe to use Micro-Glass rubber technology. Check in with your local dealer for more information about availability and ordering.